Dalton, Ga. (February 7, 2014) – California residents are being urged to reduce water consumption on a voluntary basis by twenty percent after state officials announced that they were not going to provide additional water services for over half the residents of the state on January 31. Drought conditions are predicted to “persist or intensify” through at least April in parts of 17 U.S. states, according to the Climate Prediction Center at the National Weather Service. Many of those states are located in the Southwestern region of the country. Lake Mead, the reservoir created by the Hoover Dam, has dwindled to some of its lowest levels ever. According to the U.S. Department of the Interior and the Bureau of Reclamation, water levels are more than 120 feet below capacity. 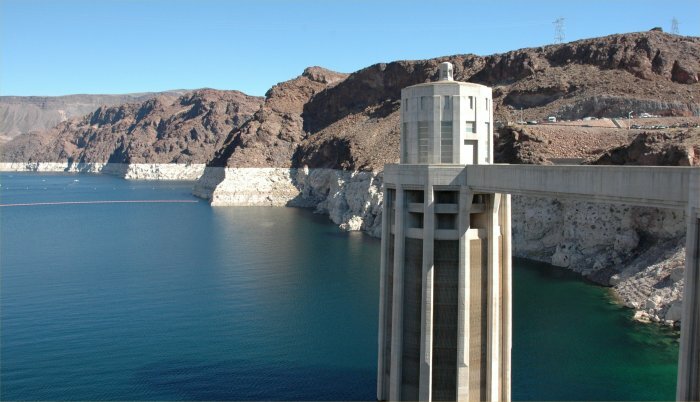 Fed by the Colorado River, Lake Mead is a source of water for much of the Southwest, as well as an energy provider for Southern California and parts of Arizona and Nevada. Water levels are projected to drop at least 20 feet in 2014, according to a recent New York Times report. Water rationing is voluntary in some areas, but as drought conditions worsen, it may become mandatory. That means no car washes, and no water for lawns or landscape irrigation. These measures may force homeowners to change they way they maintain their yards and green spaces. * Choose your plants wisely. You may want to choose plants solely based on aesthetics, but picking plants that thrive with less water is the key to keep your yard looking good no matter the conditions. Talk with the experts at your garden center about which types of plants make the most sense for your climate, and which ones might be a little more drought-resistant than others. * Go easy on the grass. For some it’s hard to imagine a picturesque yard without a lush and expansive yard. But the truth is, a green lawn usually requires a lot of water to maintain. The Southern Nevada Water Authority estimates that every square foot of natural grass replaced with less water-dependent alternatives saves 55 gallons of water per year. If you don’t want to part ways with your lawn in favor of natural landscaping that’s more water-friendly, you have another option: synthetic turf. Any sports fan would know that synthetic turf has come a long way over the years, and now looks more natural than ever. Companies like Synthetic Turf International (STI) specialize in providing synthetic turf for residential and commercial uses that looks and performs like natural grass that could save 99,000 gallons of water each year for an average lawn of 1,800 square feet. The SoftLawn® product from STI requires virtually zero maintenance, can be easily maintained with a leaf blower and is made from 100 percent biodegradable or recyclable materials. Considering the average homeowner spends 150 hours a year maintaining his lawn, you can save a lot of time and money by going synthetic. Examples of synthetic lawns can be found at www.synthetic-turf.com. * Add mulch. Covering the soil around your plants with a layer of mulch or compost can help improve water retention, inhibit growth of water-hungry weeds and cool soil temperatures to keep your plants comfortable when temperatures rise. Natural mulches break down and are absorbed into your soil, which means there’s little maintenance besides adding a new layer when appropriate. * Make your water work harder for you. No matter what you do to drought-proof your lawn, you’ll likely still have to do some watering. Drip irrigation systems can make your water go further by applying it directly to the root of plants. If you’re watering by hand, water in the morning when temperatures are cool, and apply water to the soil rather than directly to the plants. Installing a rain barrel is a great way to put the water that runs off your house to good use – and you can use that water even if watering restrictions are in effect. If you’re tired of maintaining your yard when the mercury soars and the rain stays away, it might be time to adjust your planting strategy this spring to make your yard naturally resilient. Most drought resistant improvements are good for the environment too, allowing you to feel good while you also save yourself time, money and effort.